The other day I saw the most amazing rug that had me freaking out. The colors! The pattern! So I then spent the next, oh, way-too-many hours rug shopping online. The fact is, though, as much as I love decorating and obsessing about ALL the details, I kind of hate shopping for rugs. First of all, they’re stupid expensive. Secondly, there’s too much pressure to find the right size, the right color, the right thickness — well, because they’re so expensive and you don’t want to make an expensive mistake AND if you’re like me, you can’t really afford the rug that’s actually the right size for your room because it’s like thousands of dollars. So we’re going to need a new living room rug when our renovation is done. Ugh. We currently have a white shag rug that I LOVE, but after a few years of dirty dog paws, wearing shoes in the house, and near constant wear and tear, it’s looking real, real sad. I’m totally considering replacing it with the same one, but that’s BORING, right? So I’ve also considered doing something totally different with a bold pattern and/or bright color. We’re holding off on making any rug decisions until after the kitchen reno is done, to see how everything fits together, but it’s still fun to look! 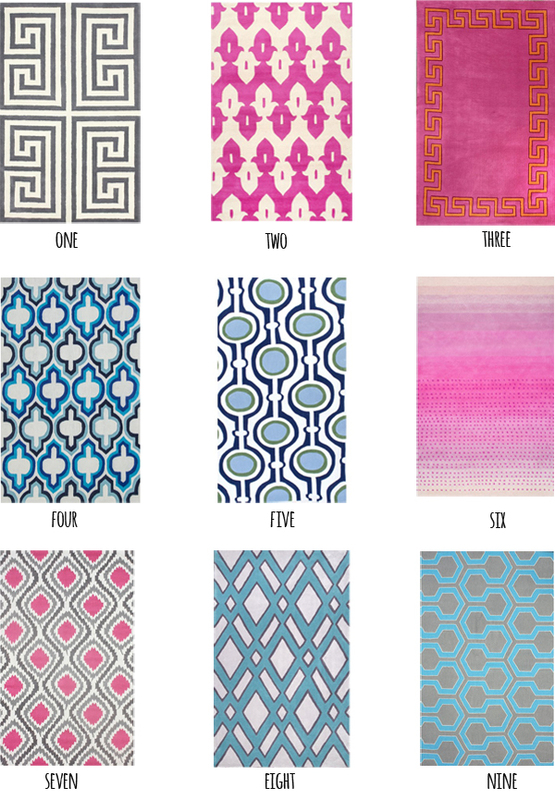 All of these rugs are from Rugs USA. This is not a sponsored post at all, but that’s just my go-to place for looking at tons of relatively affordable rugs in one place. Did you notice that #5 is the same one that I was obsessing about, in a different color? I like the blue even more! Also, ta-da, we’re decorating our living room in pink and turquoise! You can go ahead and pretend to be surprised. ;) I actually am putting together a post about our updated design plan, along with some tips for how to make a design plan for your own house!